Distortions and Reflections by John Neville Cohen. Distortions, reflections, & filters. Acetate & mirror reflections. The only way of avoiding distortion is to project square on to the choice of screen and to rephotograph the image with a plate camera. Then one can correct the angle of view with the lens movements as used for architecture, or perspective correction. Focus can be a problem, if too great an angle is attempted, but just as stopping down with a camera increases depth of field, it is also possible with the projector. Place a mask between the projector lens and the screen and see how out of focus areas of the projected image will then become sharper. By using both methods quite exaggerated distortion can be successfully achieved. 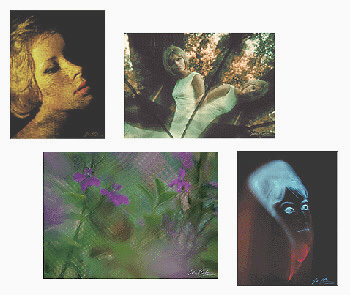 An example of a greatly distorted portrait is plate 14 (above). This portrait was projected at a fairly sharp angle, on to some silk, in order to thrust out the chin. The angular image suggested the required dramatic sculptured look. Another fascinating way of manipulating a projected image is to consider reflections. The principle involved is basically to rephotograph a projected image as seen in a mirror or bounced off a mirror. But instead of using a mirror, there are many other options. Try a piece of acetate film as this material allows one to bend or twist it, and so distort the image seen, by forming a flexible mirror. 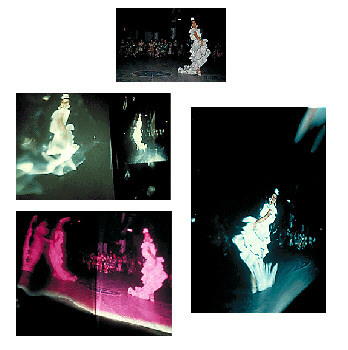 There are two quite different effects achievable even with the flexible mirror in a fixed position and the same image projected. The first method is to project the image on to a screen and to photograph the reflection seen. The other is to project the image into the flexible mirror, so that it bounces off it, on to the screen, it is this new image that is then to be photographed. These reflections do require a lot of patience to produce what is desired, but the results that can be achieved amply justify the time and effort involved. There are many reflecting surfaces that can be used. They do not always need to be smooth, a highly polished old silver cigarette case, with a machine finished pattern as an over all design, was used to advantage to create plate 60 (above). It is the blurred areas of the picture that are the most influenced by this machined pattern reflection. The end result however has transformed what was not a very interesting original picture. All photographs including those techniques already described can be made into patterns rather like a kaleidoscope by the use of mirrors. By positioning mirrors at right angles to each other, with the image projected on to a choice of screen in such a way, that the reflections are repeated in the mirrors will then form a pattern that can be photographed. Two quite small mirrors were placed on a white surface in this way to form plate 15 (above). The possibilities of scale and size are no problem when projecting images, the biggest building in the world can easily be projected between a couple of small mirrors, or on to a small object!